"Chins up, smiles on." Wow. 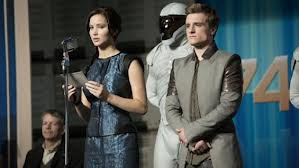 Lionsgate has unveiled the first full-length trailer for The Hunger Games: Catching Fire, the sequel to The Hunger Games, adapted Suzanne Collins' bestselling sci-fi novels. Oscar winner Jennifer Lawrence returns as Katniss, and Josh Hutcherson as Peeta, as well as Elizabeth Banks as Effie and many others. Actor Philip Seymour Hoffman as Plutarch Heavensbee gets some screentime in this, as well as many other old and new members of the cast. To be frank, this looks excellent. Francis Lawrence has taken the reigns of this series and elevated it to new heights. It's a fantastic sci-fi world that they've brilliantly setup to an epic conclusion and I honestly can't wait to see this play out. Enjoy! The Hunger Games: Catching Fire begins as Katniss Everdeen (Jennifer Lawrence) has returned home safe after winning the 74th Annual Hunger Games along with fellow tribute Peeta Mellark (Josh Hutcherson).Francis Lawrence directs the film written by Simon Beaufoy (Slumdog Millionaire) and Michael Arndt (Toy Story 3) and it arrives November 22nd, 2013. Excited?